Building log cabin walls is more art than science. The basic principle is simple, you notch one log to fit over an intersecting log on the perpendicular side. Each log is stacked in this fashion to build a sturdy cabin. Getting the logs to fit properly requires a lot of skill and practice. You can cut notches in a variety of ways, but the most common is the saddle notch. For this project, you will use a scribe tool to trace the outline of the bottom log on the intersecting log, and then cut out the notch with a chainsaw. Building log cabin walls is more art than science. The basic principle is simple, you notch one log to fit over an intersecting log on the perpendicular side. Each log is stacked in this fashion to build a sturdy cabin. Getting the logs to fit properly requires a lot of skill and practice. You can cut notches in a variety of ways, but the most common is the saddle notch. For this project, you will use a scribe tool to trace the outline of the bottom log on the intersecting log, and then cut out the notch with a chainsaw. Lay two parallel foundation logs on a bed of gravel or cement. 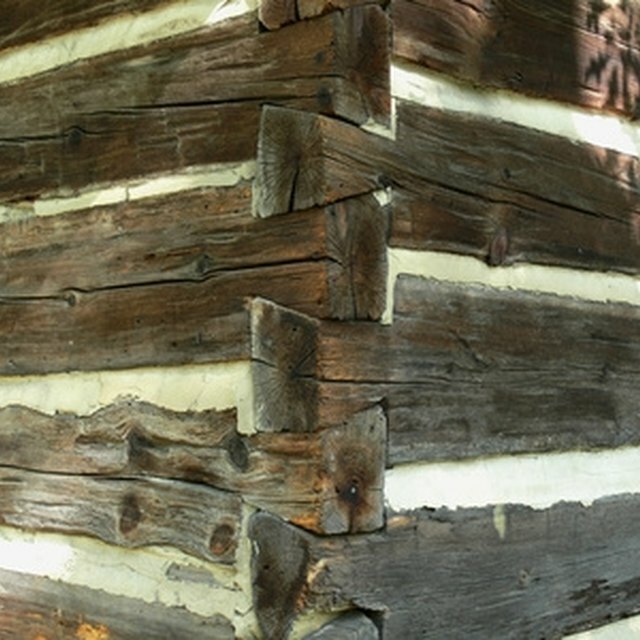 These parallel foundation logs make up the longest opposing sides of the log cabin. Cut two logs (one for each side) about 4 feet longer than the cabin wall sides. Roll one log onto the two foundation logs, into position to form the wall. Trace the outline of the foundation log with a scribe right on this log, measuring the height, depth and shape of the notch. Do this for both sides of the log. Roll the log back a few feet or secure it on a saw horse. Then cut the notches on both sides. Make several vertical cuts inside the scribed outline with the chainsaw to the depth of the notch. Cut diagonally into the wood to "chisel out" the remaining wood. Roll the log back onto the foundation logs and inspect your notch to see how flush it is with this log. Roll the log back again and shape the notch until the log lays even. Repeat Steps 3 to 5 for the other shorter side. Now you have two logs laying across the foundation logs, and the beginnings of all four walls. Lay your next set of logs across the ends of the shorter sides, and on top of the foundation logs, scribing and notching them as you did before. Build your entire log cabin in this method, and cut out the doors and windows after you are finished. This saves time and makes for a stronger, more even cabin wall.